The number one way to improve your baking is to start weighing your ingredients. Weighing ingredients is more accurate than measuring by volume — a cup of flour can vary up to 30% but the weight is always the weight. The increased accuracy provides a predictable result, and with it more success. Weighing ingredients is easy and makes your kitchen life easier. The only difficulty is that many American cookbooks do not list ingredient weights in their recipes and trying to figure out the conversions is a chore. After getting frustrated from looking up the weights time and time again, I finally decided to create my own chart. I suggest printing it out and either taping it inside one of your kitchen cabinets or laminating it and keeping it on the counter for easy reference. 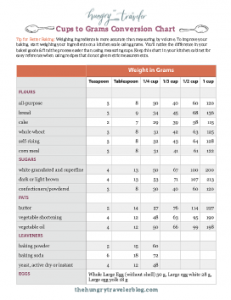 After you receive the chart and confirm your email address, you will be directed to a page that includes my tips on how to use the chart and get started weighing ingredients.